I am back today, sharing more of what I learned so far in design class. In no time at all, we were diving right in, pairing up in teams and role playing the designer/client experience! We each had to be the client and come up with a room that needed design work. Then, we switched and became the designer, giving the vision for the space. As the client, we had to give a detailed list of what the room already had and what we wanted to change. We then came up with questions for the designer and got ready to discuss our vision for the space. When I was the client, I decided to remodel our bathroom, since we really are planning that renovation. The role playing designer came up with great ideas and really listened to my suggestions. (Which is what I will always try and do for real clients. I think that part is so important.) When I was role playing the designer, the client chose her master bedroom. She has an older, historic home with wood floors and plenty of original details. The previous owners had painted the floors and now the paint is peeling. She was looking for a romantic cottage feel for the space and loved the color purple. My mind immediately started spinning with ideas! I suggested she sand and stain the floors a dark walnut brown color. This will hide any imperfections in the floor and help bring the original look back into the space. I also suggested a light purple, with gray undertones for the walls, with one wall wallpapered in a large damask print. This will act as the focal wall, and the wallpaper will go on the wall behind the bed. To neutralize the rest of the space, I suggested crisp white bedding, with accent pillows in various shades of purple. (I thought the color combination of white, gray/purple and brown was a nice combination.) This is a wordy post, isn’t it? Well, if you made it this far- thanks! 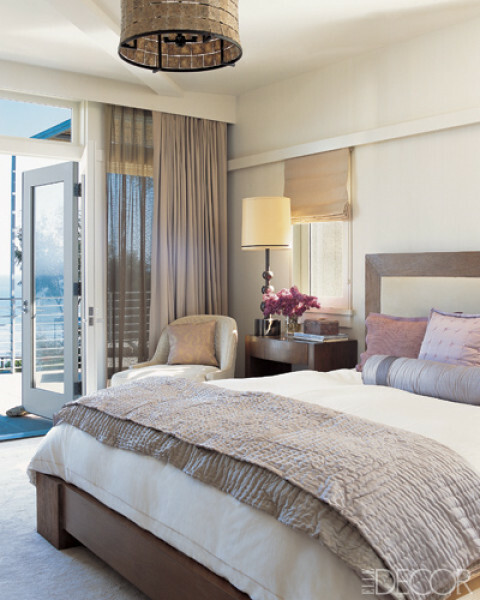 Here are some pretty master bedrooms that are inspirations for the above space. Enjoy! If you would like to transform your dwellings, please e-mail me at simpledwellings1@gmail.com and visit my design services page link above for more information. I am ready to start decorating!